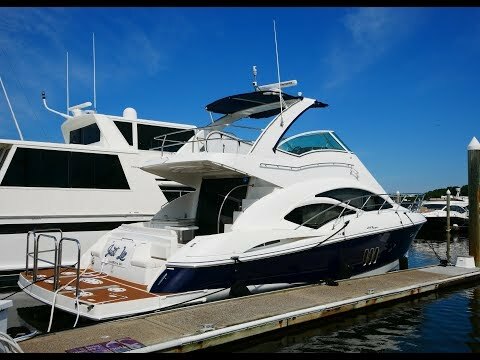 Home » Boats For Sale » 2012 Cruisers Yachts 447 Sport Sedan. 2012 Cruisers Yachts 447 Sport Sedan. Cruisers put the "SPORT" in Sport Sedan. Built on the offshore hull from the Sister-Ship Rampage 45 Convertible gives this boat a Blue Water pedigree. Truly a "CLASS ACT" that is loaded. Perma Teak Decking, The quality look with out the work. Walk Up Bridge with loads of seating. Lots of Sedan Bridge Sport Yachts but not many with an 18 degree aft deadrise that will tame the water and provide a very comfortable ride. Power Lift Swimplatform makes loading and taking you water toys an easy process. It is even remote controlled. removable safety rail and swim ladder extend the use of the cockpit. The transom has port and starboard facing aft seating and a large truck for fender and line storage. Perma Teak decking look great but without the work of teak. Walk through transom door into the cockpit. Transom seating, Wetbar with Ice maker and sink located in the cockpit. Walk up to the bridge and be impressed. Perma Teak steps through the safety hatch to the AIR-CONDTIONED BRIDGE. L-Shaped lounge to port with refrigerator drawer under. Cocktail Table. To starboard is another wetbar with plenty of storage below. Up a step on the dinette /Galley area. To port is the L-shaped raised curved dinette with easily seats four and provides a great view of your surroundings. To starboard on the dinette level is the galley. Portside is the private guest stateroom . Step down into the space and there is a settee. Twin berth oras shown with the filler to form a single queen berth. Plenty of hanging locker and storage space. WASHER DRYER is behind cabinet door is the guest stateroom. Accessed from the guest stateroom and the companionway. Vaccuflush System head, Vanity with vessel sink, medicine cabinet with mirror. The master is forward with a centerline queen berth. Lots of storage under the berth , hanging lockers and cabinet storage. Vanity with designer vessel sink, Medicine cabinet with mirror. Stall shower with folding glass door. Accessed from the cockpit is the home of the twin Volvo Diesels and IPS Pod Drive. Low hours, suoer clean engine room. This is a great opportunity to own a late model Cruisers Sedan Bridge that is loaded with all the "RIGHT STUFF"